The energy that is produced when an object vibrates, also causing vibration of the surrounding air particles is known as sound energy. These sound waves or acoustic waves are known as compression and rarefaction when occur in high pressure and low pressure regions, respectively. The molecules gather together forming the regions of compression (produce high pitch sounds) and tend to move apart forming the regions of rarefaction (produce low pitch sounds). The speed of sound depends on the medium through which the sound travels. It is greater in solids than in liquids and gases, because the vibration is much easier to transmit with materials having closely packed molecules. For aeronautical purposes, the speed of sound at sea level is 340m/s at 15oC. This level decreases with the altitude as the temperature drops. When an elastic structure is deformed and released, it vibrates about a mean position. And the sounds will be produced if the vibration frequencies fall in the audible frequency range, which is termed as harmonics. 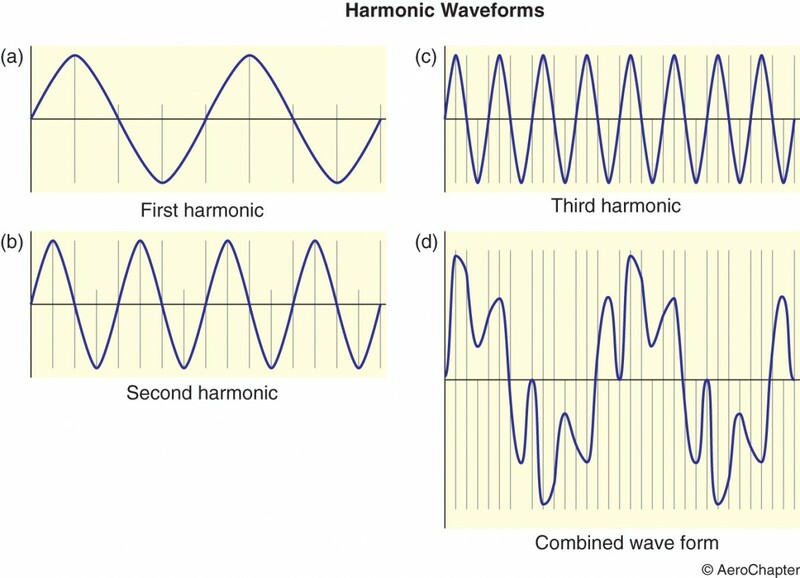 The harmonic series is a sequence of frequencies that starts with the fundamental frequency, which is equivalent to plucking an open string on a musical instrument. The following figure shows the plotted graphs of the sound waveforms. An interference between two sounds with the same amplitude but different frequencies is known as a beat. The beat frequencies are low and are calculated by subtracting the two original waveform frequencies from each other at specific instances. The beat frequency is calculated using the formula below. Thus the beat pattern is obtained by adding the amplitude of the two original waveforms at regular intervals. So, the change in one of the waveforms will alter the beat frequency. The change in frequency, which occurs when the source that is emitting the sound waves experiences movement is known as the Doppler Effect. The following figure explains the Doppler Effect or Doppler shift. It shows that a stationary sound source emitting sound waves in all directions at a same speed and frequency. Whereas with a moving sound source, the sound waves moving in the same direction become closer together showing smaller wavelength and greater frequency. This is the reason for the increase in the pitch of the sound as any vehicle approaches and vice versa.